Aurora Suite 2005 helps people with physical disabilities use their computer more effectively and helps them easily communicate with the people around them. Below is a brief summary of the features of Aurora Suite designed specifically to help people who need Augmentative Communication. To get detailed information and animated examples of Aurora Suite's many features, have a look at our Aurora Suite 2005 Tour. We also offer a Feature Comparison Chart for the three editions of our product and a brief list of some of the new features in Aurora Suite 2005. - Professional Edition for most users. If you need this sort of help, you need the best. The Professional Edition includes comprehensive typing and speech assistance and Aurora's full feature set and support options. - Standard Edition for basic typing and speech assistance. - Value Edition for basic typing assistance. Aurora Suite provides advanced word prediction and abbreviation expansion to help speed up typing, save keystrokes, and allow more text to be produced before tiring. We've compared it against the competition, and always been pleasantly surprised with the results. If keystroke savings is your goal, you've found the product you need. Aurora Suite comes standard with a 125,000 word vocabulary which means that nearly every word you want to type will already be in there, you won't have to type out names in full the first time anymore. Additional language dictionaries and English dictionaries ranging from 1,500 to 625,000 words are also included. Aurora comes trained for word prediction, but it also learns from you as you write. If you want to get it up to speed even faster, Aurora Suite can import your documents to learn your personal writing style and specialized vocabulary. Aurora Suite offers abbreviation expansions so you can preprogram a short phrase to type which expands into a longer one. 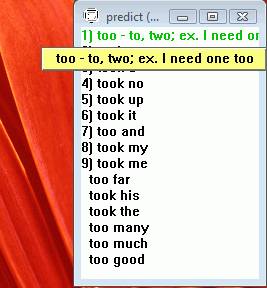 If you have trouble remembering codes, the prediction system will prompt you just like any other word. You can make abbreviation expansions for text or speech, and with a dictionary capacity of 1,000,000 words, you can program practically as many as you like. Aurora was the first to introduce multiple word or phrase prediction, not just predicting, but also learning new phrases in addition to single words. You can see in the example below, once you have typed in a two word phrase such as the name "Michael Smith" once, the program learns it so that it can offer you the entire phrase at once the next time. You can use the same technique to build longer and longer phrases into the prediction vocabulary. Unlike conventional word completion which matches spelling exactly as it attempts to guess the word you are typing, Aurora Suite includes phonetic word completion which often cues the writer with the correct word in blue even when they have not spelled it correctly. When you type punctuation, Aurora knows to back up over the extra space, type the punctuation, and then add the right number of additional spaces afterwards. When you start your next sentence, it will also capitalize the first word for you. This helps slow typists reduce keystrokes. Talk is the ultimate conversation tool. Just type what you want to say then press Enter to speak it. You can also assign frequently used phrases to function keys for instant spoken communication. It organizes, categorizes and lets you search what you have spoken before, and lets you say it again easily. 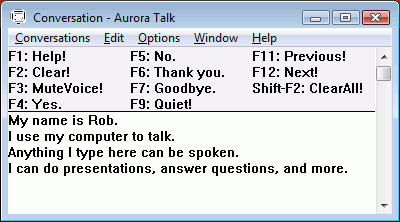 If you are doing a presentation, Aurora can also read from your email, web browser, or nearly any other application. The Echo toolbar can read any text you mark with the mouse or keyboard, or it can read menus, dialogs and windows just by putting the mouse cursor over them. It can also read the contents of the clipboard as well as the word, sentence or paragraph you are typing. Aurora Suite includes speech synthesizers from Microsoft, and support for the excellent free L&H synthesizers and any other synthesizer supporting the industry standard Microsoft SAPI interface version 4 or 5.